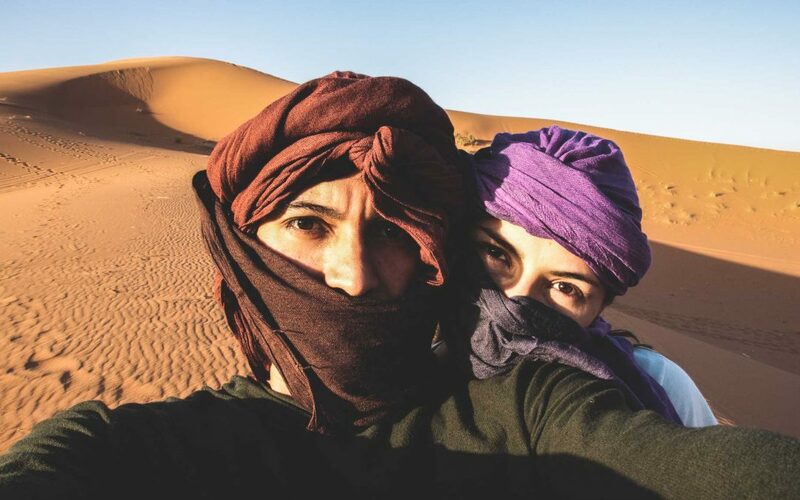 This is a guest post written by Dur Montoya and Luis Barreto (pictured here in Morocco) about encountering corruption while attempting to arrange a volunteer placement. We were in Morocco as part of a trip around the world, and we thought it would be cool to do some volunteering. Not being sure of how to go about it, we researched on Google and clicked on the first NGO that came up, and just emailed them asking if they wanted help. It was a children’s centre based in Marrakech. We quickly got a reply from someone claiming to be the director of the organisation, with an overview of volunteer responsibilities, the rules and the costs. We were travelling on a budget so we weren’t able to pay the volunteer fees plus expenses, but as we are both media and film professionals we thought we would have something useful to offer the organisation in exchange for hosting us. So we filled in the form anyway and sent some examples of our media work, asking whether they would waive the fees if we took professional photos for them. We soon got an email back from the director accepting our proposal. He said that instead of us going to the children’s centre he would prefer us to visit another project which was based in a village called Asni in the mountains, which supported women in agriculture. The email made other promises too, like offering for us to do a photography exhibition with our photos. We were happy to support in whatever way we could, but it wasn’t our main goal to take photos for an exhibition. The deal we eventually worked out over email was that we would volunteer for one week in Asni to take photos, and that accommodation, food and transport would all be provided, included an airport pick up. But when we arrived at the Marrakesh airport there was no-one there. We called the number we had for the director, but there was no answer. Speculating that something urgent had come up, or that there was confusion about our arrival time, we travelled into town by ourselves and checked into a hostel to wait. We researched on Google and clicked on the first NGO that came up. It was two days before we heard anything else – another email from the director, saying that he needed more time to arrange the accommodation in Asni. He suggested that while we were waiting we go to a different location first, a tourism program that supports the NGO in a place called Nbook. The email explained that we would have to pay for it, as it was a different program, but that we could get a discount by taking a few pictures. He said that during this time he would arrange everything else for the experience in Asni. With nothing else to do, we agreed to the plan and paid $200 for a 4-day tourist experience. It seemed fair. Back in Marrakesh, the director came to meet us, and introduced his “assistant” who looked to be a kid of about 17 or 18 years’ old. We were expecting to go to the NGO office, to talk about the women’s project and what kind of photos they wanted, and also to confirm that everything was being arranged for free in return for the photos we would take. Instead, the assistant took us straight to Asni after the meeting. We arrived at night and were shown to a homestay, where we were informed that the next day we would have to walk up a mountain. We were unsure as to why we had to do this, but we assumed that might be where the project was. The assistant indicated that it was our job to take pictures of the local women in the area. So we started trying to talk and be friendly with the women. But when we tried to take photos they acted aggressively and seemed unhappy, so we stopped. We tried to clarify with the assistant about whether the NGO had explained the project or obtained permission from the women, and the assistant kept encouraging us to take more photos of them. It felt weird to us so we only took a few pictures. To go up the mountain we were given a guide and a donkey. We asked why we needed a donkey, and we were told that the donkey would carry food for us as there wasn’t food where we were going. That seemed strange to us, and even stranger when the assistant said he was not going with us. So we started walking up this mountain, behind the donkey. We walked for five hours and had not seen anything – no community, no local women, just groups of tourists trekking with donkeys the same way we were. When we asked what we should be taking photos of, the guide told us to photograph the view. We had started to get very suspicious by this point, so we stopped a group of tourists and asked them what was at the top of the mountain. They replied there was nothing there, that we were in a trekking area for tourists and people go there just to see the peak. So we immediately called the director, but of course he did not pick up. As we were in the middle of nowhere we had no choice but to keep walking. In about an hour, we came to a tourist camping ground. We were frustrated and exhausted. We stayed that night in the camp ground as it was too late to return, but decided to head back the next morning. The guide was upset with us, as he expected for us to continue the trek, but we insisted. The next day we arranged to get to a small town where we could meet the director and find out what was going on. He arrived in a taxi and seemed flustered and angry. He argued that he took us out of the the “normal tourist system” and that it was dangerous and expensive for him. He said he had paid a bribe for us to be allowed to volunteer in this way, and that now he owed money because of us. He demanded we give him our pictures and also a huge fee, which we didn’t have. That’s when things turned really ugly, and he started threatening us. He said that Marrakesh is a small place and that he is well-connected, and he would be able to track us down if we tried to hide from him. At this point we were really scared, and we gave him around $200 which was all we had. But we couldn’t give him the photos as we would need a computer to download them. He seemed to accept that and said he’d take us to a computer, but not before taking us to another tourist area and forcing us to take more pictures for him. Eventually we got back to the hostel in Marrakesh. The director insisted that we complete a feedback form asking us about our experience, and he said we were required to do it before he left. Remembering his earlier threats, we filled out the form and just had to lie and say everything was fine. We were too scared to tell the truth. We wished that we had understood the principles of learning service before we had embarked on our trip. Looking back on this experience, we can’t believe how naïve we were. We did no research into the organization at all, and we never even made it to the NGO office. Now we realise that the person who styled himself as the “director” was probably nothing to do with the organisation, and the NGO may never have known we were there. We have gone on to do a lot of volunteering in places around the world, much of it in exchange for our media skills. We wished that we had understood the principles of learning service before we had embarked on our trip – if only we had taken the time to research the organization and also be clear on their need for photos, we probably would not have ended up in such a scary situation! Luis Barreto and Dur Montoya are a Colombian couple who are the founders of Zoom IN social impact media company .They have spent the best part of the last decade travelling around the world, volunteering and working with NGOs and social enterprises spread their message through multi-media. They were the masterminds behind and producers of the Learning Service videos. Part of this story is quoted in Learning Service: The Essential Guide to Volunteering Abroad.